Above: The remnants of a rocket engine test stand (center) were still visible near the German town of Lehesten decades after the departure of the Soviet rocket team. 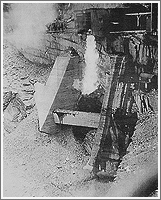 The steep slopes of the quarry provided an ideal location for the free flow of the fiery exhaust during engine tests. A facility for testing rocket engines near the town of Lehesten, Thuringia, was built to support the development of the A-4 rocket, Germany's "secret weapon" during World War II. The site was first occupied by American troops in April 1945 but three months later, Thuringia was transferred to Soviet control. In Lehesten, Soviet rocket engineers conducted their first tests of a large rocket motor for a long-range ballistic missile. Deep in the mountainous district of Saalfeld-Rudolstadt, a narrow road weaving among pines and birch trees connects the town of Lehesten with the village of Schmiedebach. To an accidental traveler, this could be the perfect setting for a mysterious tale about medieval ghosts and dragons, yet this area hides a dark story from a much more recent past. In the fall of 1943, SS troops cordoned off a large barn and several adjacent houses on a piece of ground known as "Happy Valley." Its following fate was anything but happy. Like the rest of the Third Reich's rocket development program, the Lehesten facility would be inextricably linked to the vast network of slave labor camps centered around Buchenwald. Along with the underground rocket production plant in Nordhausen, and two propellant production factories, the Lehesten site was conceived in an effort to disperse missile manufacturing away from Allied bombing raids, such as the one which devastated the main rocket development center in Peenemünde in 1943. Built at the site of a large slate mine pit which belonged to the Oertelsbruch mining company, the Lehesten facility was ideal for tests of the large rocket engines which propelled the A-4 ballistic missile. The engine's combustion chamber could be fixed to the static test stand hanging over the wall of the quarry, so that jet exhaust could run freely down the cliff, with no need for any flame deflectors. The location was found by Peenemünde engineers Martin Schilling and Bernhard Tessmann along with Gerhard Degenkolb, a Nazi government official responsible for the assembly and production of the A-4 missile. Apparently, Lehesten also offered existing caves and tunnels, which could be used for the production of liquid oxygen. (10) This cryogenically cooled chemical served as an oxidizer in the engine of the A-4 missile. By the end of 1943, the inmate population of the camp Laura reached 1,200 people. In the following 19 months of camp operation, 2,500 prisoners from 10 countries, primarily from France, Poland, Soviet Union and Belgium went through the hell of camp Laura. Jewish inmates were part of its population as well. Although on paper it was a "labor" camp rather than an extermination camp, for many the difference would be irrelevant. It is estimated that as many as a third of the camp's population did not survive to the end of the war. Officially, 510 victims were registered. Upon capturing Lehesten, the Americans had restarted engine firings, obtaining their first experience in handling V-2's propulsion system. 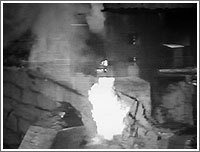 The Americans also produced video footage of tests, which decades later became available to historians. Along with other V-2 development and production sites in Thuringia, the area was transferred to the Soviet control during summer of 1945. According to the official history of Glushko's collective, the Soviet team in Lehesten with the help of German specialists "restored the test stand for testing of combustion chambers and built from scratch a second stand for the testing of fully assembled rocket engines." (424) Given the fact that two test stands had already existed in Lehesten before the arrival of the Soviet team, that might be an exaggeration. Possibly, it originates from official Soviet-era accounts, which tended to inflate accomplishments when possible. A total of 407 test firings were conducted by the joint team of German specialists and engineers from Glushko's OKB-SD design bureau. (424) Witnesses said that an entire V-2 rocket was erected on the test stand in Lehesten and test-fired without an actual launch. 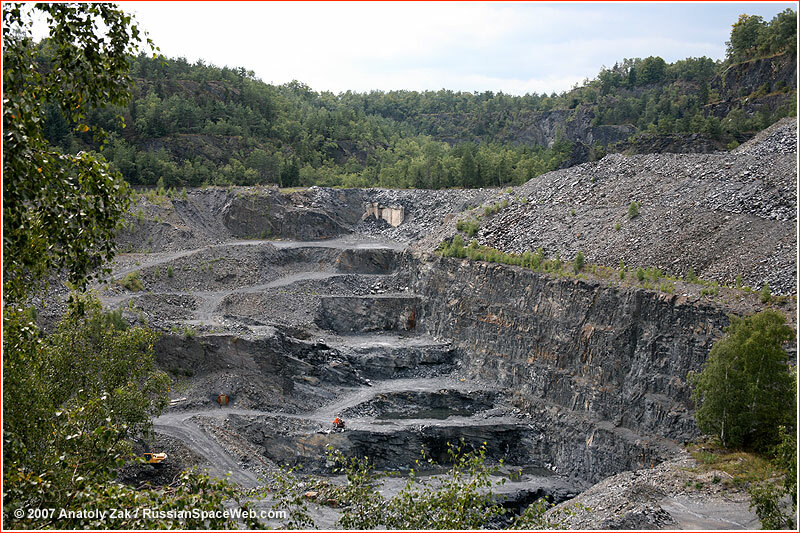 The continuation of this work in Lehesten, however, presented a problem for the Soviet authorities. The site was located in extreme proximity to the American occupation zone and could easily be monitored from the opposite side of the demarcation line. Before the end of 1946, the Soviet authorities dismantled the Lehesten site, sending movable hardware along with specialists to the USSR. Remaining test-related structures were blown up at the beginning of 1948. A similar test site for rocket engines was established near Zagorsk, north of Moscow, and eventually became Russia's main rocket engine test center, known today as NITs RKP. The first test stand in Zagorsk was modeled after the Lehesten's facility and its construction benefited from the hardware dismantled in Lehesten.